I have a new recoil spring assembly the way from Glock for my 43x right now. I had 900 rounds through my 43x and I was getting FTE (eject) at a rate of about one every 20 rounds with 6 different magazines. It acted better with stronger ammunition but it was happening with several different brands/ types/ weights of ammo. Also, the slide was failing to lock back on the last round most of the time. 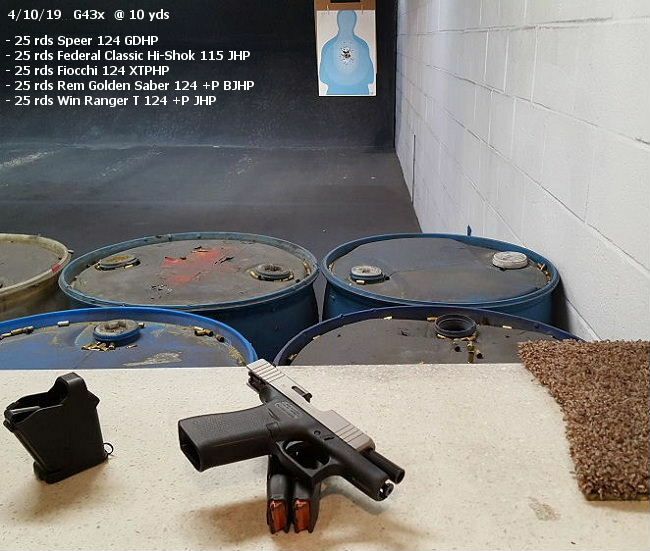 After 900 rounds, I put my RSA from my Glock 43 in my 43x and ran 200 flawless rounds of weak Federal 115 grain FMJ through it. Worked great. My wife’s 43x has been flawless but she only has a couple hundred rounds through it. Another quick range trip from yesterday. Zero issues this time, with the same 5 ammo brands used previously. Not a whole lot of rounds, but I am much more pleased, now. I'm getting very fond of this little gun. So, where is Shield Arms with their mythical flush fit 15-rounder for the 43x/48? I want them now! 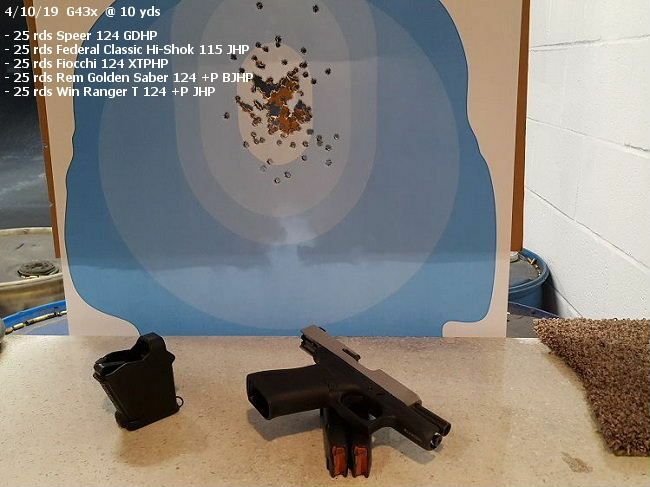 Man, after shooting 1000-rd days with the Ni P228, 125 rds here went in a blink of an eye. Nice write up, I've been on the fence about getting a G48 to go with my G43 then creating the franken 43X. Just one question, what the hell was someone shooting in the lane to your left that would make a giant hole in the ceiling panel, a grenade launcher, 10MM?, 50?? So, where is Shield Arms with their mythical flush fit 15-rounder for the 43x/48? I want them now! I'd be happy with just another 10 round magazine. Can't find one or maybe I'm just not looking hard enough. I'm a big federal HST guy myself in the 147 grn flavor. I don't think I've had any issues with those round listed though. If it's hanging up on the last round in all your mags I'd say wait until they break in a bit? Glad to hear it's going better. I recently installed the Kineti-Tech trigger in mine. Need to get some more trigger time on it, but I am very pleased. It makes the weapon feel much better on every pull. Which factory triggers are available for it that are smooth? None yet. 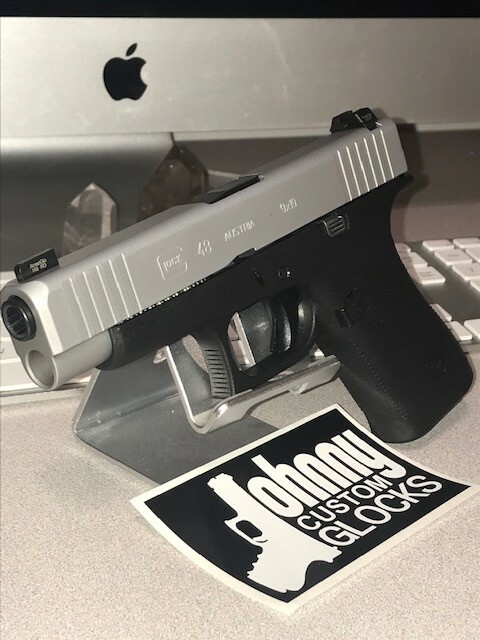 Unlike the larger Glocks, where you can swap in a full size smooth trigger to a compact or subcompact Glock, there are no models of the single stack 9mm Glocks that come from the factory with a smooth trigger. Aftermarket, or modification of your factory trigger, are your only options for a smooth G43/G43x/G48 trigger. It may have started life as a factory trigger shoe, but it has been modified by reducing the trigger safety tab and drilling/tapping an overtravel stop set screw. Plus installation of that trigger shoes requires modification of your factory trigger assembly, by removing the stock trigger shoe (destroying it in the process) and installing the modified trigger shoe. So it's doubly non-factory. You're right, I should rephrase it to factory parts trigger. Either way, I couldn't stand the serrated trigger, and installing the shoe only took about 5 minutes. I'm pretty sure that a non-modified shoe off of a G17 would work just fine, I just went with the Johnny Glocks shoe. There are ways to remove shoes without damaging them. After all, that's how Johnny removed these shoes from bar assemblies. Per an email I sent them, they are also producing a metal mag release to go with those mags. Regarding the Glock serrated triggers. There is a very easy fix. No need to replace the trigger itself. Works on all serrated triggers. How do I know it works? Did it on my own Gen4 G19. Dremel and a FELT bob...NOT one of the abrasive wheels. Use the small pointed bob at LOW speed. High speeds, even with felt, will melt the polymer. Use the tip to get into the serrations and the slot the safety rides in. Don't need to overdo it. Stop, evaluate and keep doing it until you are satisfied. All you are doing is breaking the edges of the serrations and slot. I did it with the trigger in the gun. Taped all exposed parts just in case. Probably a little easier with it out, but not a big deal. With the felt bob there is no grabbing, like with an abrasive head. I can't tell the difference now between the G19 trigger now and my smooth G34. If you're a brain surgeon with incredibly sensitive finger tips, you may still feel serrations. It should work for the rest of us though. You *can* separate the trigger shoe from the bar with the correct technique and tools, and save the trigger shoe. With the assembly out of the frame, notice that the pin holding the shoe to the bar is in a blind hole. If you place the shoe on a hard flat surface, pin facing up, you can tap the pin with a 1/8” punch a few times to create a “mark” on the blind side. Do it carefully, a little at a time, so as not to damage the shoe. Once the “mark” is well-defined, flip the shoe over and position the pin over a recess. Use a fine tip awl to tap and start the pin out (I use the Old Hickory brand ice pick). Another method is to drill a very small hole with a 1/32” drill bit in the center of the “mark”, and push the pin out with the drill bit. ETA: I don’t know where to buy an OEM Glock trigger shoe without the bar. At the SigForum international convention next year , I'd like you to show me how you get that text on your picture's , if you don't mind taking the time. On Mac, you open the picture up and use the text setting in the markup toolbar at the top, then you can save picture with the text and host the picture online. Same with iphone, except you hit edit on the top right, then the markup text toolbar is on the bottom of the screen. I have to ask, does this come with instructions? Also, is it easy to install? With the helpful instructions of a couple of members I put an OEM smooth trigger on my 43 trigger bar last night. I hope/think the pin will stay put. On some of the aftermarket pins it looks like one end is knurled to prevent movement.